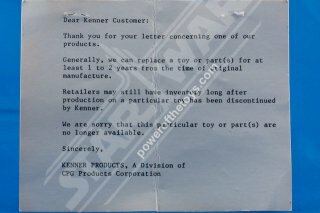 Kenner, was a company that seemed to really pride themselves on customer service. I’ve read countless stories where someone wrote into Kenner and received a response regarding their various questions or were sent freebies for unexpected delays in the various mail away promotions. The most obvious way, in which they showed great customer service, was with their “We Really Do Care” service. Pretty much every Kenner toy had a little blurb near the bottom of the instruction sheet like this. I’ve wanted one of these items ever since I got into mailers in 2007 and found some old discussion topics about them. I finally got that chance, when a little over a week ago, in doing some of my random ebay searches, I stumbled upon one. I even lucked out in winning it for the opening bid. In this case, the person mailed away for some replacement X-Wing and Millennium Falcon parts. 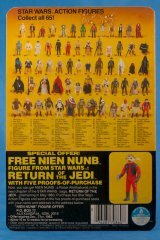 The envelope is postmarked, May 9th 1985, so this was closer to when the Star Wars toy line was winding down. 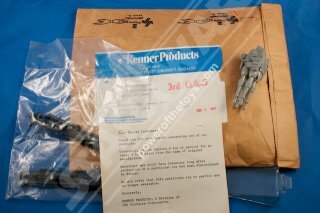 Kenner sent out a sealed bag of X-Wing canons, a Battle Damaged X-wing canopy, and a Millennium Falcon turret. 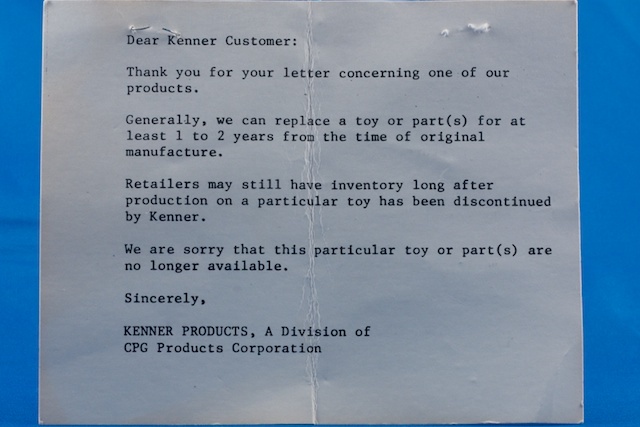 Also, included is an apology note stating that not all the requested parts were available because they were for toys not currently in production. In my opinion, these are some great items that represent the history and how great of a company Kenner was, but they are also very under appreciated because it is just a brown bag with some parts. I’m glad to finally have a piece of the “We Really Do Care” service in my mailer collection. Here’s two new Luke additions that I was fortunate to add recently. 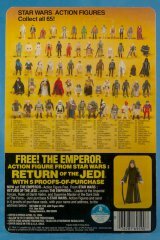 The first, has been on my want list for awhile which is a Australian Toltoys Luke Jedi with blue lightsaber. 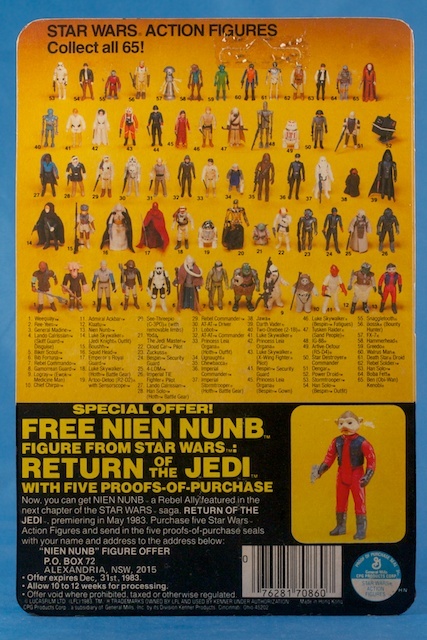 It features the offer for the Nien Nunb mail in offer and one interesting thing of note is that it still mentioned Revenge of the Jedi on the offer even though the top of the card and back say Return. These were later covered up with a sticker fixing the name change and then ever further on were printed with the correct title. The next addition is a 65C Blue Saber Luke. 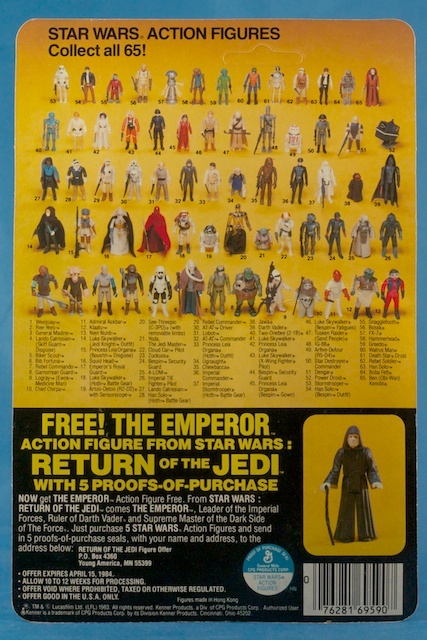 The 65C card has 65 figures on the back and the Emperor mail in offer on the lower corner. 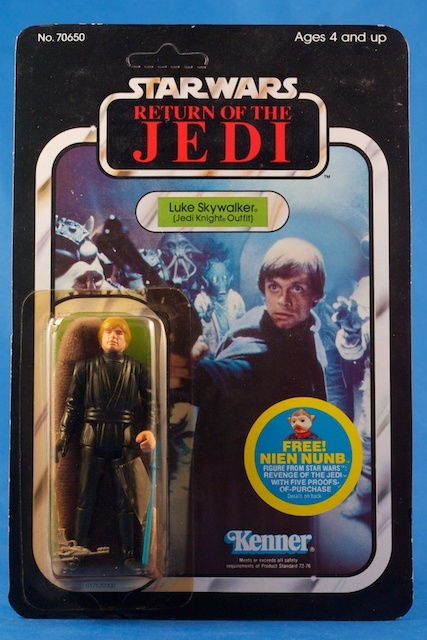 It is the last U.S. card that you can find the blue lightsaber Luke, before the next batch of figures were released and the back of the card was updated to 77 figures. For those that aren’t collectors, but familiar with the movies, you might be wondering why they even made Luke’s lightsaber blue in the first place as it was green in the movie. Here is my theory that makes sense to me. 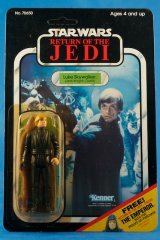 In the early trailers with the Revenge of the Jedi title, some scenes actually show Luke with a blue lightsaber. Here’s a still from one of those early trailers. It has been said that Industrial Light and Magic was having trouble with the blue for the scenes out in broad daylight, so the decision was made to switch the lightsaber to green. I think this was done very late into postproduction, so Kenner, who was working to get the toys ready in time for the movie release, actually had the blue sabers made up for the toys. Once the decision was made for green, they then moved production over to the new correct color. However, having already made up a bunch of the blue ones and possibly having them packaged at this time already. they just released them in both colors for a short while. 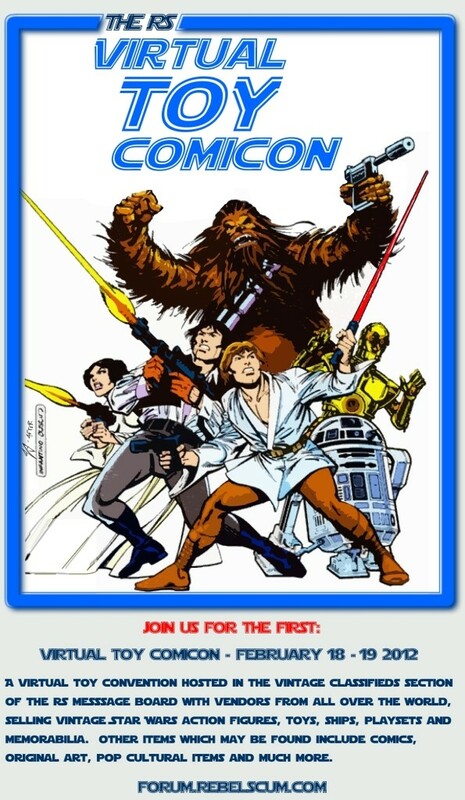 Starting tomorrow at noon is the first Rebelscum Virtual Toy Comic-Con. This is the first time that I’ve seen a concept like this done, but it seems like a fun idea. I originally was going to just participate as a buyer, but earlier this week I picked up a nice group of vintage Star Wars items locally, so now I’m attending as a dealer. Tonight the dealers are setting up their sales and I pretty much have mine all ready. Anyone that cares to take a look can view it here on the rebelscum forums. Here’s the flyer advertising the event as well. On of my more recent additions is this proof sheet for The Force lightsaber store display. 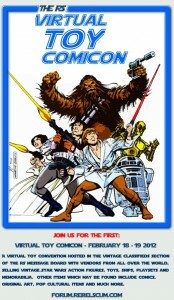 This was printed up before the movie’s title was renamed to Return of the Jedi from Revenge of the Jedi. The proof sheet shows the color bars at the top and also has the crop marks for the area that was used for the actual store display. I hope to get this framed up sometime over the next year. This came directly from a former Kenner employee that has had some great items that he saved back in the day. This friday, the first of the 3D converted Star Wars films is released with The Phantom Menace. I’m generally not a fan when a 2D movie is post converted to 3D as it usually feels flat. I’m going to give this one a try though of course because it is Star Wars. I’ve only seen one of the trailers in 3D and wasn’t too impressed with that experience. However, I’m still going to attend each one as depending on the success of each film, will determine wether we get the next and I want to have the opportunity to see all 6 films again in the theater. 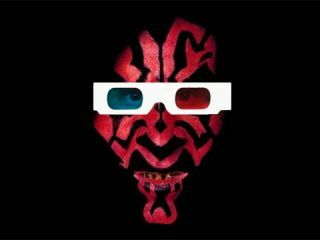 I’ll post back what I think of the 3D experience after I see it. There are also theaters showing it in 2D, so I’ll probably see if again the old fashioned way too.